Nic was out and about in Haverhill updating members of the business community and stakeholders on progress with the research Park and taking the first booking for the Epicentre – the Innovation Centre which will be the hub of the development. In the morning Nic presented to local business owners at the monthly bestof Haverhill event before addressing members of the Haverhill Area Working Party in the afternoon. Cllr John Griffiths, leader of St Edmundsbury Borough Council, welcomed the pace and energy of the project, saying it is realising the town’s potential. “I am absolutely delighted that the Haverhill Research Park is making such excellent progress," he said, "and proud that St Edmundsbury is playing a full role in supporting this project, which has the ability to deliver 2,000 new jobs for the town. "We have a strong track record of investing in success, and this project, like others in the town, is moving with pace. Speaking at the bestof Haverhill for the fourth successive year Nic reiterated the aim of the research park was to compete with the best in class. It would offer a science park environment that was comparable to anything that Cambridge had to offer for considerably less cost. The aspiration for Haverhill Research Park was that it should deliver a sustainable community. Mr Rumsey said the realisation of that objective was already coming to fruition with the success of the housing development and the new pub. The Arboretum, which has planning for 150 homes, was experiencing unprecedented levels of sales. Original plans estimated the houses would be built and sold over a five-year period. Since the site opened nine months ago 40 units had either been sold or are under offer. If demand continued at the current rate the development would be completed in three years. Marston’s have reported that The Flying Shuttle, the new rotisserie and grill restaurant which opened in May, had the busiest opening day for any new pub they have launched. The restaurant, which has created 50 jobs, provides an excellent meeting place for the research park. A 4,000sq ft day nursery is a key element of the plan to provide a sustainable community. Negotiations are currently in progress with a Montessori nursery to move to the site offering a 70 to 100-place setting for children aged two to five. An announcement is expected by the autumn. The research park itself comprises 400,000sq ft over four service plots. The buildings can be tailor-made according to the exact requirements of the client, with a typical laboratory costing around 20-50 per cent less than it would in Cambridge. After a four-month wait planning permission has recently been received for the Innovation Centre. The Epicentre will be a 34,000sq ft contemporary building over four floors with views across open countryside. Open 24/7 and incorporating a coffee shop, meeting rooms, a 'hot desking' area and 52 individual office suites the Epicentre will be the hub of the research park. Hot desks will be available on an hourly, weekly or a monthly basis. A 184sq ft office space, suitable for two people, inclusive of all costs apart from broadband will cost £124 per week. 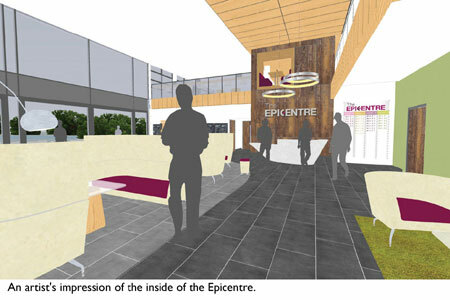 Applications for funding for the Epicentre are in progress with the Local Enterprise Partnerships and the plan is to go out to tender in August with contractors on site by October and the centre opening in September 2015. Virtual tenancies are already available offering local businesses the opportunity to have a Haverhill Research Park postcode, post handling, an @theepicentre.net email address and conference and meeting facilities at the Days Inn Hotel at reduced rates. Elaine Carr, owner of the bestof Haverhill, said: “I think the business community are genuinely excited by the opportunities that the research park will bring to the town. "The success of the Arboretum and The Flying Shuttle demonstrate to me that people appreciate the quality of the environment and are buying into the vision for the Research Park. 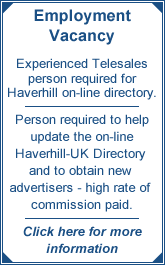 Visit the Haverhill Research Park to keep up to date with the latest progress – www.haverhillresearchpark.com or call Helen Chaplin on 07584 232 339 for more information on the virtual tenancies.